Background: This blog-post marks the start of a special series of conversations with Social media thought-leaders, experts and mavens to answer some of the most important questions surrounding the subjects of Social media and Web2.0 ! The emphasis of this discussion series is to address ‘socialmedia’ at a ground level and talk about the real world issues that are being faced by us on both sides of the road: i.e. as users and as consultants/agencies. I am fortunate enough to start this series through couple of email exchanges with Dennis D. McDonald, Ph.D. I discussed with him, wide variety of topics like definition aspects of Web3.0, geographical variations in user communities and social media project strategy. 10 thrilling days of 2008 have passed and finally I am writing my first post of the year. Although, I hadn’t planned for this particular post but a series of developments have provoked me to write about a topic which I’ve addressed in the past before. Online Custom T-shirts services are quite popular in the West and the rest of the world with Zazzle.com, Cafepress.com, Shirtcity.com and Threadless.com among the popular ones. Coming back to India, although the growth was little slow initially, recent trends indicate this business has started picking up well. Several companies now offer consumers a well thought-out solution for online gifting. Other than that they’re leveraging the community aspect by allowing the designers to showcase their designs and generate revenue out of it. I had talked about online-gifting portal Myntra last year which are conventionally different from photo-sharing & gifting portals like Picsquare, Itasveer and Fobaz. Since then, there are several other websites that have come up. Pringoo.com – Pune based Pringoo.com is a recent entry in the market of customized products. Site users can Create & Share unique designs, Buy unique collection of designs and Sell their collections at a % commission. The range of products on offer include T-shirt, Mug, Teddybear, Coaster, Bag & Mousepad. Currently in beta, the site is intuitive and it is quite evident that special emphasis has been given towards the usability. Pringoo is not just about buyers. Its a platform for designers to showcase their talent and earn from them. For the designers, the process is quite simple. They upload their creations for different merchandises, open an online store website which consolidates all their creations at a single marketplace and start selling. As far as the percentage commission is concerned the upper limit is that of 15%. It isn’t mentioned on the home-page though ! The detailed dashboard allows users to track their purchases & sales. With options like ‘My Sales Report’ you can analyze which of your creations are doing well. There’s another very-useful for buyers. Most of the designs are available for more than one product and below each design you can find out the product for which it is available – Now that’s a very handy feature which I didn’t see in Myntra. At times it happens that you like a design and you would like to have it on your cup – this feature is certainly helpful on those occasions. Check out more coverage on Pringoo.com here !!! Footees.in – Is one of the funkiest sites around and as the name suggests its all about tees…. The mood of the portal is targeted towards the youth. Footees is a product from the house of Hyderabad based eYantra – a popular name in the gifting & merchandising industry. GNOME T’s – Mumbai based Gnome might not be the best in usability, navigation and user-friendliness but its driven by ‘Users’. Users submit their designs which are rated by the community and everyday there’s a winning design. Like Footees.in Gnome is also in to just T-shirts. The designs at Gnome are also available at retail stores across Mumbai for all those aren’t tech-savvy. Site designers need to improve upon the look-and-feel and even think about partnering with retail stores outside Mumbai. webVastra.in – Sluggish design, text which is not readable, bad color combination 😦 nope there’s more to webVastra than just that ! Bunch of IIT guys have got together to provide customized t-shirts from the export house from Tirupur, TN. Primarily users can create their own designs or buy pre-designed T-shirts. Myntra.com – I’ve covered Myntra.com previously and since that time Myntra.com has grown in stature. The quality of T-shirts, features for designers, various contests you got them all at Myntra. It does rock for sure ! The above table lists the average price of half-sleeve large t-shirt at various custom gifting portals. Its quite clear that Pringoo and Myntra’s prices are slightly higher. Its because of the quality t-shirt brands (Wrangler, Banana Republic) they use. For B-School students this seems to be a perfect case study in the making. Yeah, I am talking about embracing of social media by Fastrack,a leading youth fashion brand by Titan. 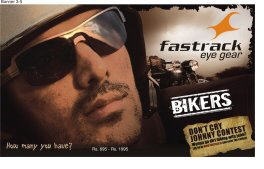 It has been almost 10 years since Fastrack launched and it has picked up quite well in the last decade. This year is special for two reasons – Fastrack has launched NEON Disc and its new portal called media.fastrack.in which could turn out to be a real hit among the web junkies. I must admit that I’m yet to try out the watch but I’ve been fairly impressed by the portal and the video advertisement thanks to YouTube. ‘NEON DISC’ is special as it doesn’t use hands to display the watch and the time is shown by, two concentric aluminum discs which represent the hour and the minute. The NEON sheet lights up on the push of a button, thereby aiding in time telling. The price is between 1195 to 2195 although according to the provoking advertisement, the price range starts from Rs. 595. The site has been given the shape of a blog (why are comments closed?) and they’ve used a stand-alone a blogging platform WordPress.org. Really great to see an Indian company using my favorite platform 😉 As far as the blog is concerned I’d personally love to see more stories behind the development of these two fantastic products ‘Bikers’ and ‘NEONDISC’. The Flickr stream has the entire collection of Eyegear and Watches. Do check it out as you’d find some really cool shades and sporty watches out there. I think it’d be much better if the site Flickr stream uses dynamic thumbnails for images. For passionate bikers and sports watch lovers there’s a Fastrack group on Facebook. The group is a platform to bring the biker community together – from India and overseas – to discuss trends, issues, products & offers, tips & advice, events and more…related, of course, to biking and maybe the great outdoors. I notice that there are 83 members already in the group – A healthy number. There’s plenty happening out there a Don’t Cry Johny Contest, members posting cool biking videos and more.. Apparently, there’s another portal fastrack.in, which took fairly long time(a flash movie) to load on my firefox browser.Unfortunately, there’s no ‘skip the movie button’, so all I could do was wait. (btw fastrack.in has shades of the Sony Ericsson’s k750i micro-site). Pretty impressive stuff overall and could go well with the youth if executed correctly. Disclaimer: I do not have any association with Titan/ Fastrack. The opnion here is my own and does not represent my organization. All right the first presentation is here and it is about “Speed up the performance of your Website”. This presentation is by Lalit Patel, from Uzanto and he is talking about Pareto’s principle and empty v/s full cache. Wow looks good but I am trying to pick up the pace as he is speeding up. Excellent presentations on Performance Tuning in MySQL and Replication in MySql by guys from OSS Cube. Always a thing or a two to pick up from there especially the later one. The presentation on Mysql was more generic and easy to connect with. Good stuff ! Keep it up. Saurabh from Valueone comes in um.. looking a shade nervous and excited too ! Oops the pen drive is not working properly, Saurabh humbly apologizes. Arunima is taking us through php documenter. Talks about official websites where it is available, why it is needed, what it can do and stuff like that. Right she walks us through the php documenter with a live demonstration of it. There seems to be an interesting problem with this camp. Somehow, I am seeing too many presentations by the conference sponsor. Guys I thought this was supposed be an OSS Conference. Oops ! People, are running just too fast and jumping and hoping. Well, my confidence and enthusiasm has evaporated suddenly and so is Mita my colleague and fellow blogger. What do we do next? Well sitting like dumb faces out here and trying to digest the security presentation. Sorry if any one of you took it the wrong way, but it is too rigid. Ok finally we’re free from the clutches as we’d a good conceptual presentation about CiviCRM and its background philosophy. Yes ! Easily the best presentation of the day so far. It’s by Mir Nazim and is about Drupal and its best practices. Gud start he’s talking about using the CVS code and says don’t just download abruptly from drupal website. Excellent presentation mtv.co.uk well that is one of the best examples of websites using Drupal. Mir has also beautifully addressed on the community aspects of drupal and using Drupal as a CMS for websites. Noel talks about his background, his jobs & life his project and most importantly his philosophy in life. Today Noel, a renowned Drupaler rejoices when he meets fellow folks from the community. Noel also addressed the value of tools like Twitter, Paypal and some more. Well, he is a rare bunch of talent currently busy with his Luck of Seven project. Seven continents, seven months, 7777 dollars and diving into seven oceans with the essence to cover seven key points bloggers, couchsurfers, barcampers, agents of social change etc. Noel & Mir sign-off the day in style. Much needed inspiration coming in from the two of them, thank you guys. Day 1 comes to an end. Summary Note: There would be different opinions from different people, some would say it is more tech-centric some would it is generic. Well as a buddy rightly said in one of the comments, forget everything, OSS has been an effort to bring folks from different regions but with a simliar line of thought together, it’s the effort from sponsors, organizers that matters. Long live the spirit of OSS, gud job OSSCube. My friend called me up last night to inform me that his small software company had hired a new marketing consultant, an “out of the outter box” marketing thinker. “Blog, blog & blog” – The first idea floated by the creative consultant. In response to common questions the consultant said blogging is the latest trend, blogging is growing, companies are engaging with customers, with potential employees and this gives them ability to maintain strong relationships with their stakeholders. Blogs allow people to participate in a conversation and make it more interesting. One brain questioned the consultant – Let’s assume we start blogging and so does every-body else who belongs to our category. Let’s also assume we embrace other social media concepts. Let’s say these blogs start getting good response from the community (2-3 comments per post), many page views, google pagerank, technoratis, diggs and everything else you can possibly think of. We’ve have joined the Web2.0 bandwagon like everyone else and now we understand what exactly our customer thinks but so do others. So what next? And you thought you didn’t know Web two dot ooh!! Following is a transcript of conversation between two desi nerds – “I” & “He” – who talk about a revolutionary concept that is redefining the way people use internet. xFRUITS offers its users 10 powerful functions ranging from converting RSS feeds to mobile/pdf to RSS aggregator utility. Another Ultracool feature that xFRUITS offers is conversion of feeds to voice. Each item of the feed is converted into feed by VoiceFruits service. Its web-based and doesn’t required an installation. xFRUITS allows you to network with other xFRUITS users thereby making collaboration faster and also allowing users to read feeds of other users.